The Portuguese Government decided to build a new airport to serve the Lisbon region, which will be located some 42 km east of the city center on the South bank of the river Tagus. The site is currently used by the Portuguese Armed Forces. The decision was driven by the lack of additional capacity at the current Lisbon Airport and the impossibility of significantly expanding the existing facilities. The airport is today completely surrounded by residential and commercial buildings. In order to accommodate the new airport, part of the existing military infra-structure will be deactivated and transferred to another location, thus liberating an area of roughly 7 500 hectares. Operations at the New Lisbon Airport should start by 2017, with the facility being built on a DBOT (Design Build Operate Transfer) in conjunction with the partial privatization of the concessionaire ANA - Aeroportos de Portugal S.A, the Portuguese airport operator. - Opening day capacity for 22 million passengers per year, reaching 43 million passengers per year in 2050. The total investment costs associated with this project are estimated between 3.1 and 3.3 million Euros, and the main social impact identified is the creation of 34,500 new jobs, of which 19,100 are direct, 11,150 are indirect and 4,250 are induced. 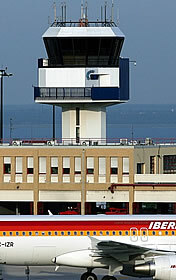 The airport’s impact on the Portuguese GDP is estimated to be in the region of 1.6%. The new Lisbon Airport is a highly relevant project, both at a national and European level, and is acknowledged as such by the European Commission, qualifying as a Priority project within the Trans-European Transport Network. Tender and Preparatory Works The tasks to be carried out with a view to launching the international public tender are at present at an advanced stage of development, their completion being due by the end of March 2009. From that date onwards, the Portuguese government will, thus, be able to launch the tender for the privatization of ANA and the construction of the new airport. Given the fact that the tender structure will include several procedural phases, it is expected that it will be completed 12 to 14 months after launching, following which the construction work for the new airport will actually begin. At present preparatory work for the tender are being carried out, encompassing various areas, such as environment, technical, financial and legal aspects. Reference Master Plan At present, a Reference Master Plan for the New Airport is undergoing development, with the opening day capacity requirement of 22 million passengers per year and around 133 thousand tons of cargo. This plan already caters for future expansion until the end of the foreseen concession period - the year 2050. By this date it is estimated that capacity will be set at 43 million passengers per year and around 405 thousand Tons of cargo. The Reference Master Plan also incorporates the land accesses to the new airport that have already been established by the Government (see attached map). In the light of the existing decisions, the New Lisbon Airport will be linked to the Lisbon - Madrid High Speed Rail Service, which is due to start operating in 2013. This High Speed Rail Service, as well as the conventional rail services, should make use of the third Tagus Crossing (TTT-Terceira Travessia do Tejo), a new road and rail bridge, to be built between the two existing ones, at Chelas (on the North side) and Barreiro (on the South side). A fast rail shuttle, with a frequency of 4 services per hour and a travel time of approximately 20 minutes linking the terminal station at Lisbon and the airport, is also foreseen. The new airport will also benefit from road links that will allow for a user choice of toll and toll-free itineraries, and its proximity to the new Poceirao logistic platform will come as a mutually beneficial relationship between these two important infrastructures. As part of a consortium, ANA is also directly involved in the management of 12 regional airports in Peru.